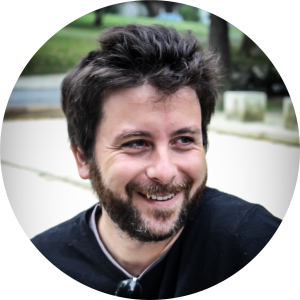 Mark your calendars for this spring’s EU author tour, featuring EU Prize for Literature winner David Machado! April 3rd, GEC 1005 at 6:30 p.m. A wonderful and informative discussion ensued. This page includes information on the book, author, prize and grant supporting this initiative, as well as resources for in-depth engagement. Use the buttons below for quick navigation, or scroll on through to browse. 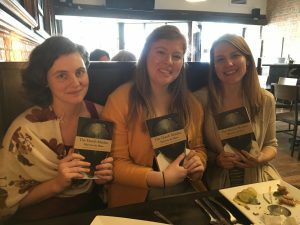 You can check out resources from the 2018 EU author tour as well! The European Commission, which acts as the executive branch of the EU, funds the EU Prize for Literature through the Commission’s Creative Europe program. Creative Europe aims to recognize European art and talent and promote international discussion. The prize is awarded to one individual from each of the twelve nations participating in the contest each year. Of the thirty-six countries participating in the program, twelve nations are eligible to compete each year, allowing a large variety of states and languages to be recognized throughout a cycle of three years. The prize requires winning books to come from established authors, to not yet have been translated into more than three languages, and to be the author’s most recent work. Winning books are selected by National Juries chosen by several intra-Europe publishing and editing councils. Find more information on the EU Prize for Literature website. With support from our “Getting to Know Europe” grant from the Delegation of the European Union to the United States, we able to host Marente de Moor on the UNC-CH campus and also at the University of Pittsburgh. 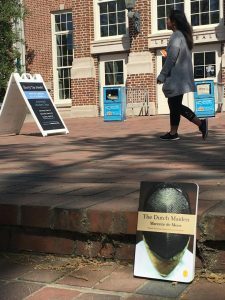 The Center is very pleased to welcome de Moor state-side in April. 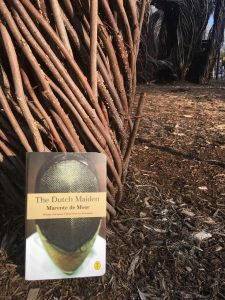 Students and community members – especially local book clubbers – have been reading “The Dutch Maiden” and are looking forward to engaging with the author. Reading a novel which has received recognition from the EU, by way of the EU Prize for Literature, provides an interesting way in which to look at the European integration process in the context of artistic expression. The “Getting to Know Europe” funding is intended to promote understanding of the EU in local and regional communities throughout the US. You can read more about this initiative on the European External Action Service’s website. The GTKE Grant will enable us to host another EU Prize for Literature winner here next spring as well. We hope to then undertake a targeted fundraising campaign in order to keep maintain this programming as an annual event. On page 10, Xavier asks why people don’t ask for help when they need it, a phenomenon which is repeated throughout the novel (and is embodied by Daniel). Why don’t people ask for help when they need it? Is asking for help a subtractive process? If so, what does one stand to lose? Xavier seems to struggle with mental illness, as do other characters in the nove l(to varying degrees), yet he is treated in a cavalier fashion by others. Is there any evidence to suggest that this approach is representative of the Portuguese treatment of the mentally ill, and how does this compare with that of the U.S.? The more Daniel tries to quantify his happiness, the more his value vacillates and seems to worsen– are we wrong in trying to quantify our happiness? Xavier won’t implement his plan of moving to increase his happiness because it would first need to decrease. Is this realistic? Do we have to be unhappy before we can be happy? Daniel keeps an obsessive blueprint of his life called, “The Plan.” In what ways does this document affect his happiness? In what ways does structure increase our happiness? In what ways does it hurt it? In what ways does Daniel use Almodovar’s imprisonment to justify his own separation from his family? Consider Almodovar’s imprisonment, Daniel’s self-exile, and Xavier’s reclusiveness – how are they similar? How are they different? Why do you think the EU would give an award for literature for this book? Comment on the narrative strategy. How is the story told and why is it told in this manner? Comment on the novel’s depiction of friendship. Comment on the role of the absent character(s). How is Europe depicted in this novel? Do you think happiness can be measured? How and why might one wish to quantify happiness? The author has stated that “The Shelf Life of Happiness” is “a book about happiness with unhappy people” (qtd. in Briggs, Mark. “EU literature prize winners: Winning is an honour, but surreal.” [Accessed 1/24/2019.]) Do you agree with this assessment of the text? Why or why not? Joel Schalit refers to the novel as “a form of social criticism of the crisis, and how Europe arrived at it.” Schalit goes on to explain that, “the limitations these characters are forced to live with communicates the profound immobility Europeans have felt over the last seven years, and which, for many who live in the south, remains a constant. There are so few opportunities for personal advancement that they fear punishment for trying to anything [sic] about it whatsoever. No wonder so many Greeks, for example, find it reasonable to support parties like Syriza, on the left, and French, the National Front, on the right…. 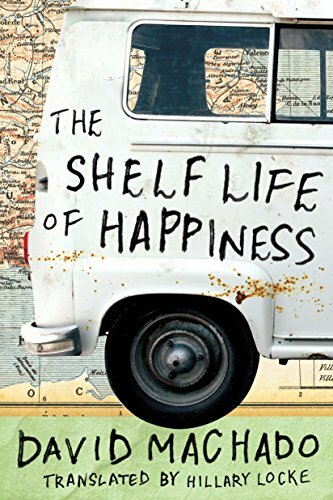 [Macado’s novel] unlocks the psychology behind this attraction, even though it doesn’t tackle it directly.” Schalit also refers to “The Shelf Life of Happiness” as a “satirization of our obsession with statistics, and how they’re used by economists, and politicians, to determine happiness. It’s a decidedly anti-technocratic reproach, one which seems especially suited to the sorts of criticisms leveled at the EU, when both conservatives and leftists, [sic] speak of its excessive bureaucracy. It’s not that numbers don’t matter. They do. But, quite often, as Machado insinuated, we forget the human stories that lie beneath them.” Did you read the novel as a critique of the EU? Why or why not? Care to take a happiness quiz? One of our undergraduate students, Brett Harris, has designed this survey: What Country Should You Visit Based on Your Happiness Index? 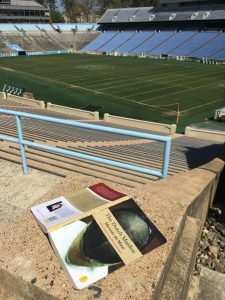 If you would like to receive a few free copies of The Shelf Life of Happiness, please contact Sarah Hutchison, PhD. 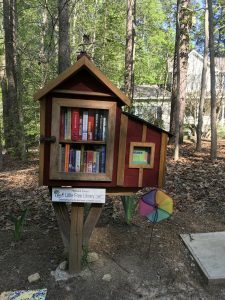 She’ll place your book club on the list! 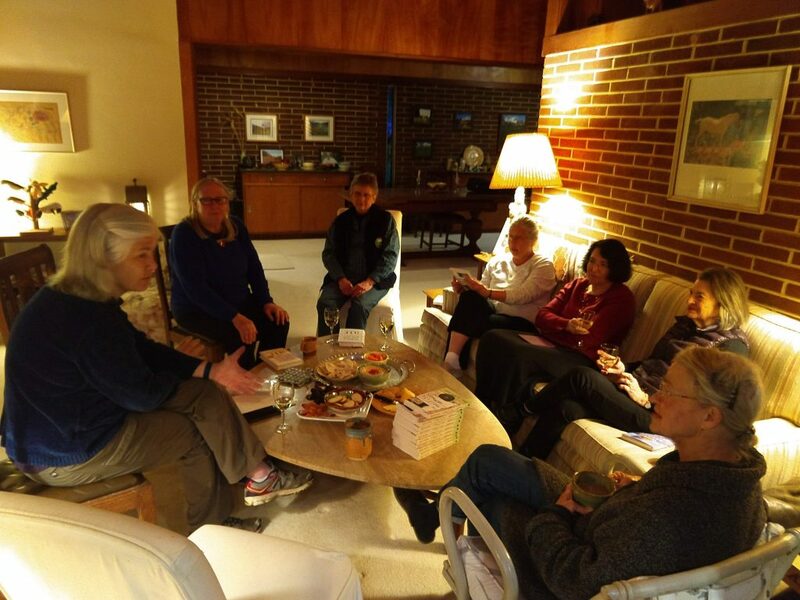 Members of the Morgan Creek Book Club in Chapel Hill enjoyed discussing David’ Machados book! 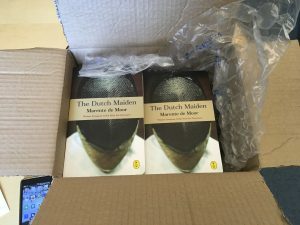 Professor Dan Thornton accepts ten copies of The Dutch Maiden in his office. He will share these with the students in his Dutch-language class. 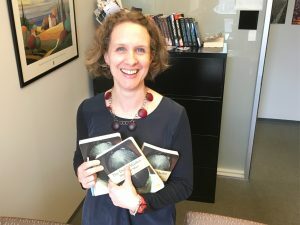 Katie Lindner, Executive Director of the Center for European Studies, smiles with several copies of The Dutch Maiden. 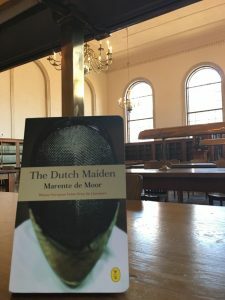 Three TAM students pose with their copies of The Dutch Maiden. 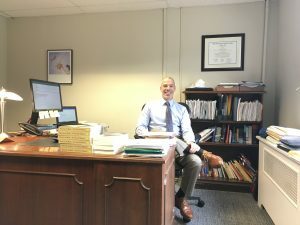 The books arrive at the Center – February 2018! 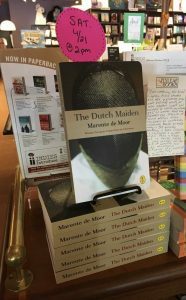 Flyleaf Bookstore displays copies of The Dutch Maiden. 1. 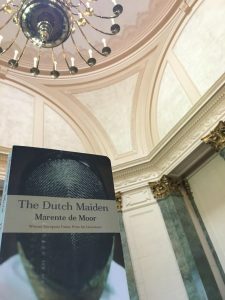 To which countries have you traveled to give readings from and / or participate in discussions of The Dutch Maiden? 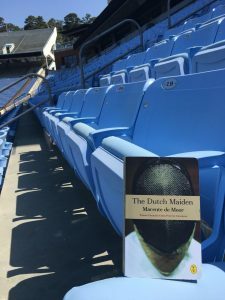 The Maiden is translated into ten languages; rights are sold to even more. I have traveled to Germany, Belgium, Hungary, Macedonia, Bulgaria, Albania, Croatia with the book so far; Italy and Turkey will follow in the near future. 2. What kind of reader response to this text has surprised you the most since the book came out? This happened in Germany. Germans are probably the most serious and devoted public a literary author can wish for – where the Dutch fall asleep after ten minutes when you’re reading for them, Germans keep their concentration for hours – but in this case, I found it hard not to laugh. A woman asked what happened to the rabbit in the book. She was dead serious: “There is a whole episode dedicated to rabbit, Gustav, in the beginning, and all of the sudden he’s gone.” I answered that he wasn’t gone, but would reappear in my next novel. Which was true, in my novel The Roundhay Garden Scene there’s a whole chapter featuring a rabbit, and a rabbit alone. 3. 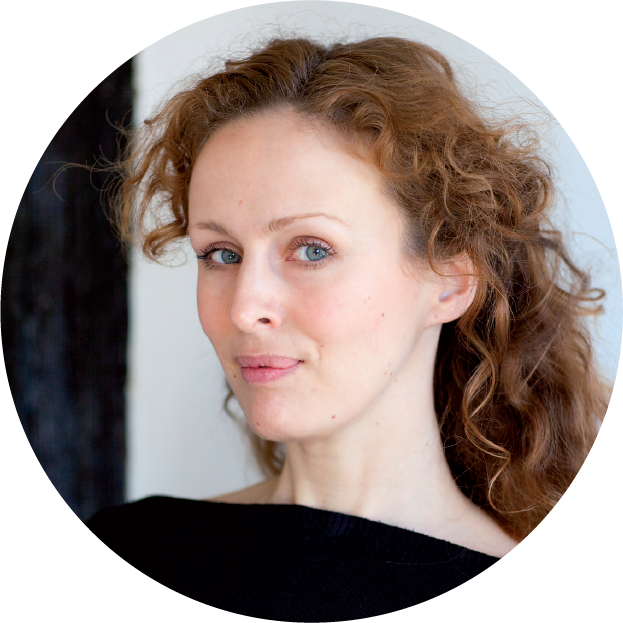 Why do you think you were chosen to receive the EU Prize for Literature and what has this award meant to you personally and in the context of the novel itself? Frankly, I don’t have the faintest idea, but this book was already awarded the highest literary award in the Netherlands before that. 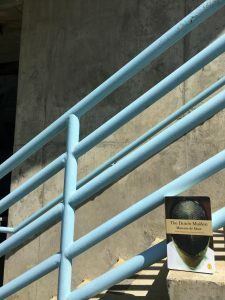 The success of this book puzzled me from the beginning, as I wrote it in a very autonomous state of mind, not thinking about any reception of it at all. It is an unfashionable book. Basically, I wrote it because I wanted to read the story myself. It still is odd to experience that it appeals to so many – now to so many abroad, even. Almost embarrassing in a way, because making it was such an intimate process. Even with the first reviews in Dutch, now seven years ago, I thought: “hey folks, I just made this up, ummmm, this character doesn’t actually exist or anything…” I don’t have that feeling with my other works at all. Please comment on the text’s narrative strategy. Who is the primary narrator? How would you characterize her? What other narrative voices permeate the text and how? What is their effect? Comment on this text’s genre or mix of genres. How would you characterize this work in terms of its literary form? At one point, the maid tells a story about the year without a summer and a pig. Explain what this story is doing within the work. Why is this episode included? What is its function? What do you make of the insistence on symmetry, borders, doubles and oppositions in this text? Cite a few examples and explain their relevance within the context of the story. Comment on the role of war within the text. Comment on the relationship between nature and society in the text. 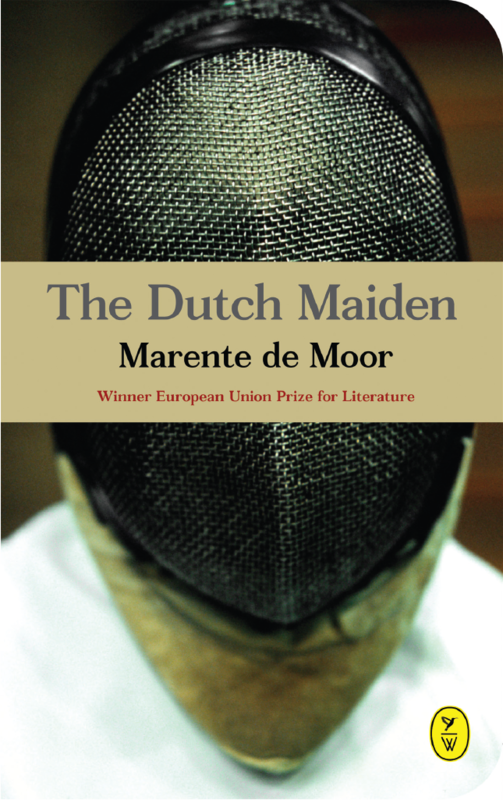 In Alastair Mabbott’s November 4, 2016 piece in The Herald, “’A gothic romance transplanted to 1930s Germany’ Review: The Dutch Maiden, by Marente de Moor,” he writes: “It’s not hard to see why this novel was awarded the 2014 European Union Prize for Literature. It’s a story of dark and dangerous passions, beautifully and dramatically bringing to life the very different inner journeys of its two main characters.”Why do you think this book was awarded the EU Prize for Literature? What links can you draw between the text’s content and the EU’s integration project? 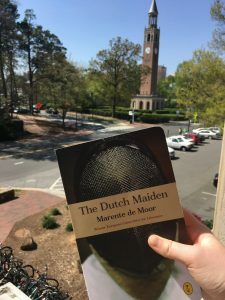 In April 2018, CES hosted two readings of The Dutch Maiden in Chapel Hill. The first took place on a warm spring Friday afternoon at the FedEx Global Education Center. 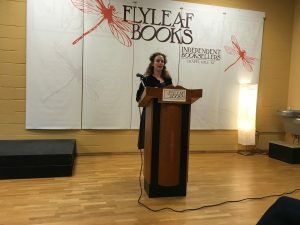 The following day, local business Flyleaf Books hosted a second reading. 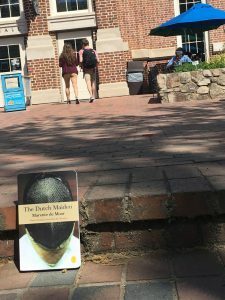 Our student organizers and staff have taken photos of the Dutch Maiden all around campus! 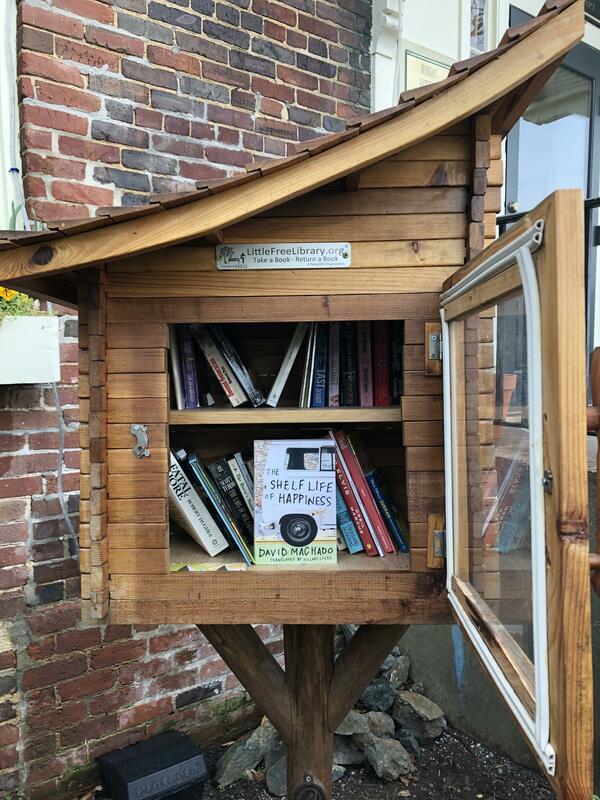 We had our Facebook and Instagram followers guess where the book is to win a free copy. 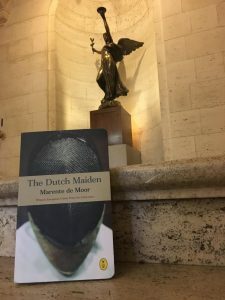 The Dutch Maiden’s themes of discovery, exploration, maturity, and sexuality envelop the tale of a young woman away from home, creating a bildungsroman story whose protagonist challenges that female archetype with her passion for combat-sport and measured self-reflection. The narrative is seemingly recounted by the protagonist decades later, occasionally caught up in her own memories—at times, she offers near omniscience, sprinkled with historical details which could only be known later. These periods contrast with series of events told with the imperfect knowledge and narrow focus of an in-the-moment narrator. The resulting combination draws the reader in to experience the most intense moments alongside Janna. 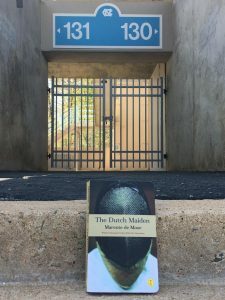 de Moor’s book focuses on Janna’s life in the interwar years of the 20th century, which might fairly be called an “underrepresented” epoch in literature, and even history. As a younger reader, it offered new insight into a period of time often glossed over or told from a perspective more intimately connected to the events of World War II—I appreciated the opportunity to watch pre-war events and attitudes unfold from the view of a narrator who is not explicitly focused on the political realm. Niche cultural and historical allusions are nestled between and amidst the key moments in Janna’s life, heightening my sense that I don’t know nearly enough about these decades, but in a good way! In addition to enjoying a pleasant read, I learned throughout. As children, many of us played at fencing with sticks, mimicking combat and pretending we had real swords. This tradition is a long one, and the roots of fencing can be traced back to Egyptian temple paintings showing fencers doing just that- using sticks for combat. From these early bouts, fencing grew as a sport deeply tied to combat and training for combat. Germany’s history of fencing in particular is storied and long-reaching. The earliest surviving combat manual is of German origin, from the 1300’s. Medieval fencing masters largely focused on combat as part of a military discipline. However, as nobles began to wear swords in public in the 1600’s, swords spread from the military and into civilian life. During this time period, the rapier was introduced and popularized. Rapiers differ from broadswords, sabers, and cutlasses in a key fashion: they are designed as a thrusting weapon. Injuries using rapiers were often fatal, and gave rise to both the art of teaching how to use the weapon, and the necessity to introduce a safe way in which to teach its use. During the 1600’s, a number of teaching treatises were written, many of which were published and reprinted for many decades after. In the 1700’s, the French court revolutionized civilian weaponry, and the rapier fell out of fashion. Its successor was shorter, triangular, but like its predecessor, it was designed to be used by thrusting. These weapons were light, fast, and dangerous, and led to the introduction of a practice weapon: the foil. Foil fencing introduced a number of rules that protected students from the dangers of dueling. It restricted the target area, the portion of the body on which points can be scored, to the torso in order to protect the face. After the invention of the wire mask, a movement to return to the dueling origins of the sport led to the creation of a second weapon, the epee, which expanded the target area beyond the torso to include the head and the rest of the body once again. For both of these weapons, the thrusting design of their predecessors led to a sport where points could only be scored with the tip of the weapon. This can be seen on modern fencing weapons, where a button on the tip must be depressed in order to score. The third and final modern fencing weapon was the saber. Unlike the foil and epee, which draw from a civilian history of thrusting weapons, the fencing saber finds its origins in the military cavalry sword. This weapon allows points not only earned by using the tip of the weapon, but also earned by cuts using the sides. The foil, epee, and saber make up the three modern fencing weapons. Each, dependent on its history, has its own rules and styles and each still has a place in the summer Olympics today. Developed originally as a dueling style, mensur, unlike its Olympic relatives, intentionally incorporates a pointed tip with which to injure one’s opponent. Practiced widely in Germany and much of Eastern Europe in its current form from the 1850’s onward, it is the last remaining form of Western fencing that uses weapons with a sharp edge. Under Nazi rule, the Third Reich outlawed Mensur due to its connection with independent fraternities. As described in The Dutch Maiden, these fraternities shifted to comradeships in order to evade Nazi attention. Mensur continued, despite the ban, and today is kept alive by the German Student Corps (Korps) and other fraternities. 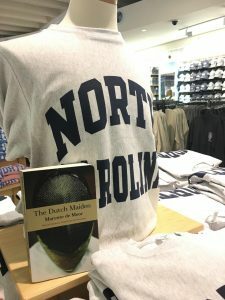 “About the EUPL” and “About the Author” (2018) sections written by Mary Drue, an Excel@Carolina student in the EURO-TAM program.